Camp can positively impact children in major ways; it can broaden their worldview by exposing them to other children, studying the flora and fauna in the mountains, sports and activities. Not only that children are having fun and enjoying, it also give them the opportunity to improve academically in learning English and improving their English vocabulary by communicating more in English during the sports activities is what this camp offers. Camp also means a time for your kids to be active with our wide varieties of physical activities such as paint ball, biking, swimming, running, playing and thinking less time on the couch or in front of your television screen. One of the main purposes of LuckyKids international camp is to provide active sports activities into the nature. The minimum staying outside is 4 hours a day. As you that the camps have children in different ages and the activities are categorized based on their ages that are appropriate for your child or children’s for their own safety. There are two types of sport activities at LuckyKids International Camp: the first are purposefully organized as paintball, horse riding, swimming, mountain hikes, while the second are organized in the free time and each child chooses in which sport to participate: football, volleyball, badminton. Playing paintball can be good and more than just for fun. There are health benefits that can be considered. Paintball has been a popular sport for a long time. Even though it is called an extreme sport, paintball is one activity that can be enjoyed with children. This sport has a plenty of benefits that bring about an all-round development in children. Apart from the physical exercise, paintball also offers mental health benefits by enhancing the imagination and problem solving skills by creating tactics and strategy with the other team members in helping to win the game. 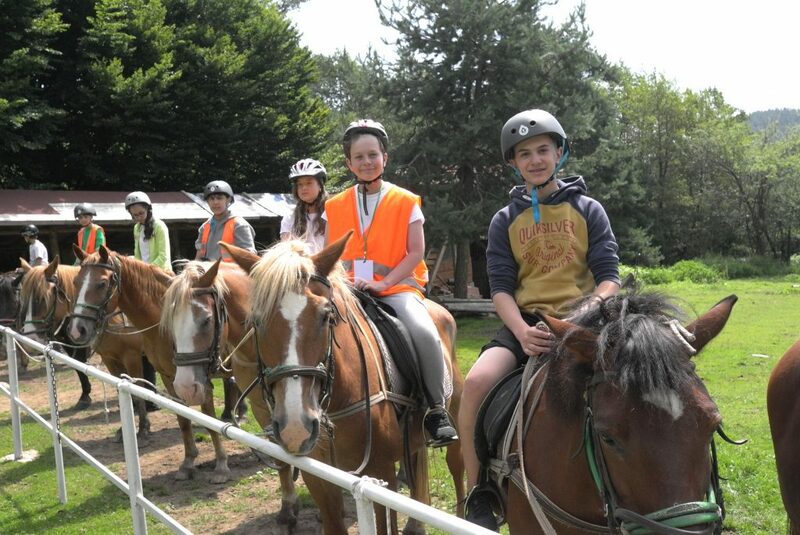 For children who have not yet reached the age of 8 and visit the camp, we organize special shootings on a target. In this way, we ensure their safety and at the same time the children are not excluded from the activity. Horseback Riding offers a great workout for both the mind and the body, physically boosting the cardiovascular system and easing stress on the mind. It is also recognized as having therapeutic qualities, the psychological benefits can be of equal importance to your as the physical benefits by simply being outdoors, enjoying the fresh air and being one with nature in one of Bulgaria’s beautiful mountains in Bansko. As a sport it also helps your children create self-discipline as it increase your child’s level of patience, focus and control. 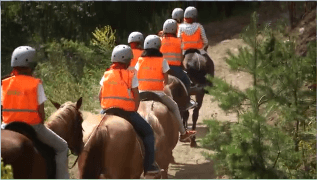 Smaller children, children with fear of horses, children with special needs receive individual care and attention from both the facilitators and the camp team. Overcoming personal self-confidence and gaining more faith in one’s own abilities is stimulated by many constructive methods and aim raising the child as a person. Children love to bike as its fast and fun and gives them freedom and independence to get around to explore. It helps them to improve and boost their positive and mental attitude as young individuals. Biking in the camp is 2 kinds depending on the terrain: in the mountains or in the park. Children have a total of 3 days in the program. Those who can’t ride a bicycle have the opportunity to learn. On every terrain, the difficulty is tailored to children’s opportunities and age. In the park there is an opportunity to ride along the alleys, but there is a jump spot for the more advanced ones. In the mountains, we have the opportunity to ride along forest paths as well as on cemented paths, the slopes of the paths are also complied. Children love to swim and play in the water. Swimming can have significant benefits for both the children’s health and safety. Especially when having new friends, swimming is a way to keep encouraging a child’s healthy level of physical and social activity. Swimming provides a more effective workout than some other activities. Swimming is not organized and swimming lessons are not organized in the camp. Children play in the pool, organize competitions and various games. The purpose of swimming is to have fun. At least once a week, children have an active mountain transition that is appropriate for the age and skills of all children. Transitions are short and necessarily organized with mountain guides. During the transition, children learn the basic rules of group movement in the mountains, to show patience and perseverance to each other, to help themselves. Clean air, nature and the sun have a beneficial effect on the physical and mental health of all camps. Volleyball tournaments are well-known in the camp. They include children, animators and instructors. Often children learn terms and expressions of the game, as well as basic game skills – body position, basic utensils, hands position. Tournaments take place during outdoor activities. They continue throughout the shift and aim to have children working in teams. Yes – Dodgeball is an official sport in many countries around the world. The game is played on Day 1 when the children have team-building games and first got hats with color indication in which group they are allocated and in any other convenient case when we are on a mountain meadow. Normally, badminton is played on horseback when children are outside for the whole day. In these tournaments, the involvement of animators and teachers is a must, and with equal result often victory is solved by a duel between the leader and the camp manager. Again, the primary goal is for the kids to have fun and to be active. With your child having to experience all our fun activities in the camp will help your child develops social skills and builds confidence. In our camp it can also help children connect with children, make new friends with locals and foreign. Whether your child is learning or meeting new kids at the camp, getting them out of the house can expose them to a more diverse group of children.